South Texas Medical Academic building at the University of Texas Rio Grande Valley May 10, 2017 in Edinburg. EDINBURG — After months of lobbying in Austin by the University of Texas Rio Grande Valley School of Medicine for state funding, state legislators produced the final numbers granting $54.1 million for the next two years for the newly created school, $7.2 million less than the last biennium. Aside from formula and non-formula funding, the university will also receive $2.5 million in tobacco funding, which Gonzales said remained close to what was provided in the last session. But total funding still lags in comparison to the $70 million requested by university officials, which included about $10 million in special item funding. 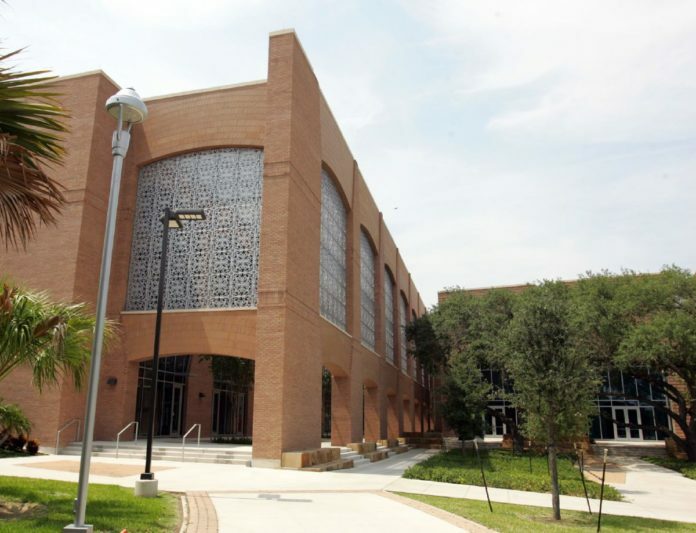 University officials were anticipating budget cuts, which affected UTRGV as a whole. This session legislator allocated about $313.1 million for the entire university compared to last session where it received about $326.3 million. Cuts to special items alone took about $10.6 million, and this, coupled with last year’s decrease in enrollment, translates into less funding. Bailey said they don’t anticipate the cuts to lead to layoffs or doing away with already planned equity and pay increases, which have been in the works since last fall. But the soft hiring freeze, which he explained focuses on hiring only necessary positions, will continue. As far as the school of medicine, Bailey said the impact could translate into cuts to planned residency programs in the future or healthcare programs provided by the university. But they are now working on alternative funding options to make up some of the difference. For now, the first and second cohort of medicine students should not worry about being affected by the cuts. Support from local cities could be part of these alternative sources of funding. That is if cities stay true to their previous commitments to help fund the long-coveted school of medicine. The city of McAllen, for example, is still pending on whether or not they will come through with a promise to give $2 million per year to the school from 2014 to 2023. Only the initial $2 million payment was given in 2014 and city officials were discussing giving $1 million last year, but no decision has been made. The issue of special funding items became an issue in Austin this session as some argued they are solely intended to be short-term support for special projects or programs, but some institutions kept the funding long-term and used it for other purposes. In the case of UTRGV, however, university officials argued that the school of medicine is the perfect example of an actual special item since the school was opened less than a year ago and it doesn’t have a full cohort of students to receive appropriate formula funding. This state legislative session has been one of the toughest due to the House and Senate budgets being completely different. In the case of the school of medicine, the Senate had originally allocated less than $25 million, while the House proposed about $55 million. The two had to come to a middle ground while in conference committee, where five senators and five house representatives vote on each issue. Sen. Juan “Chuy” Hinojosa, D-McAllen, was part of the conference committee, and said part of what made arguing on behalf of the university more difficult, was what some legislators perceived as lack of local support toward the school of medicine.